The Winter 2018-2019 Newsletter is now available to Members online. View Pedro Noguera's Keynote Speech at the 50th NCSM Annual Conference in Washinton DC 2018. NCSM stands behind quality research and supports the independence and freedom of the mathematics education researchers whose vision and hard work informs the work we do in schools and classrooms nationwide. Sometimes the findings of research challenge the status quo and cause us to question the state of the world as it currently exists. While these findings and challenges may be uncomfortable for some, NCSM believes strongly that these conversations and research are necessary to the work we do in service to educators and our students. Because no single study or research report should direct broad policy, NCSM is committed to helping leaders understand the full body of available research and giving leaders the tools they need to make informed decisions for their school contexts. This past week the same news source that targeted NCSM and TODOS' joint position paper on equity and social justice has targeted another member of our mathematics education community, Dr. Rochelle Gutíerrez, with an article about her recent chapter in a volume published by the Association of Mathematics Teacher Educators (AMTE). Read AMTE's statement of support for the volume. NCTM and TODOS have also produced statements of support containing valuable information. The mathematics education community has responded passionately in defense of Rochelle on social media using the hashtag #IstandwithRochelle, and supporting the research agenda of not just this one individual, but also the work of all researchers. NCSM believes in research and academic debate, thus we strongly condemn the content and nature of the personal attacks against researchers and the work they produce. NCSM joins its voice to the resounding support in the mathematics education community for researchers, particularly Dr. Gutierrez in this context, as well as research in general and the role it plays in making the futures of our students brighter. As the 2016-2017 school year begins, we invite you to join with educators from around the country and possibly the world in A Call for a Collective Action to Develop Awareness: Equity and Social Justice in Mathematics Education. Here you will find a listing of articles and books identified by several mathematics education organizations and mathematics educators. Each month's reading(s) has a set of focus questions for you to consider during that month as you reflect on the readings. Over 20 vignettes of first-hand successful coaching experiences are now live on It Worked! -- a new section on Coaching Corner. In December 2015, the NCSM Coaching Committee collaborated with a group of math specialists, teacher leaders, coaches from all levels at McDaniel College in Westminster, Maryland. "Improving Student Achievement by Implementing Highly Effective Teacher Evaluation Practices"
Purchase NCSM books and merchandise in our online store. If you wish to make a nomination now, please be sure that your nominee is an eligible member who is interested in running. Members eligible to be placed in nomination must be in good standing as of May 15 one year prior to the nominations deadline. The NCSM Affiliates are valued members of the NCSM organization. 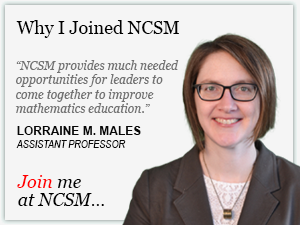 Please read more about our current affiliates and the process to follow for your mathematics education organization to become an NCSM affiliate. This website is designed and maintained by Stellar IT Solutions.